Now that summer is drawing to a close, it’s a great time to readdress your fragrance wardrobe. There are some pretty strong trends for the new season; gourmand fragrances with almost edible notes of caramel, liquorice, vanilla, or chocolate are leading the way for women, while there is a tendency towards the aromatic for men. 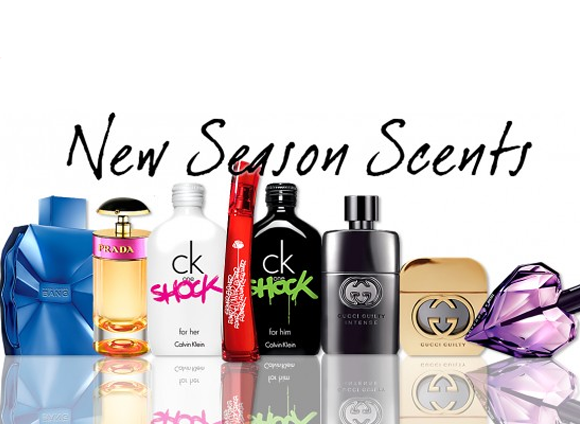 Take a look at the new season treats below for a hit of on-trend olfactory goodness.. This brand new scent from the luxurious house of Prada is a little different to previous offerings. Girly, sophisticated and hedonistic, the fragrance appeals to the frivolous nature in all women. An overdose of the three main accords creates a feeling of excess: there is an unprecedented 12% concentration of Benzoin, a decadent dose of timeless Musk, and a fun-filled twist of addictive Caramel. The art deco inspired bottle is pure pleasure, with a bold silhouette, a shiny black half moon pump, and a band of shocking pink Saffiano that hugs the beautiful flacon. The place where high fashion meets high energy is where you’ll find this new scent from Marc Jacobs, a reinterpretation of last year’s popular Bang scent. This incredibly stylish fragrance is fresh and dynamic with an aromatic twist, and it wears very well on heated skin. Masculine notes of Coriander Seed, Cardamom Seed, and Fennel Oil provide a crisp opening, while a heart of Clary Sage, Sandalwood, and Patchouli mark a strong character that sets the pace for the dry down of Benzoin, White Amber, and Cashmere Tears. The striking and structural Bang bottle is refinished in bold metallic blue for a touch of edgy style. These brand new incarnations of the CK One fragrance family are a more rebellious expression of the youthful CK spirit. Vastly different from the fresh citrus tones of the original scent, these fragrances combine unique and addictive notes that are inspired by the feeling of a wild night out. The CK One Shock for Her is sweetly sensual with notes of Passion Flower, Jewelled Poppy Flower, Liquid Chocolate, and Blackberry, while CK One Shock for Him gets the adrenaline pumping with a Red Bull Accord, Black Pepper, Tobacco Absolute and Ambreine. The original CK One bottle is coated in lacquered black and white, and finished with arresting graffiti logos in neon hues. The wildly popular Gucci Guilty scents for Him and for Her have been reworked and intensified for the truly daring. The original notes of Gucci Guilty for Her are overdosed: Pink Pepper becomes even more piquant, the Lilac is creamier, and the Amber and Patchouli base is more hypnotic. Gucci Guilty for him is intensified and deepened: the Lavender and Lemon opening is even fresher, the Orange Flower heart is headier, and the Cedarwood and Patchouli base is incredibly sensual. The darker fragrance character calls for a darker bottle, and the glass of both flacons has been made smoky and mysterious. This new scent from Diesel is all about sensual intoxication. With hypnotic notes of Mandarin and Star Anise in the opening, creamy Vanilla, Gardenia and Jasmine at its heart, and an addictive dry down of Liquorice Liqueur, Woody Notes, and Amber, Loverdose is a secret weapon of seduction. The woody gourmand juice is trapped in a beautiful multifaceted heart-shaped bottle, with a dagger through the centre that conceals the atomiser tube. Finished in an opulent purple hue and topped with a shiny black stopper, the Loverdose looks as good as it smells. This vibrant interpretation of the iconic Flower fragrance celebrates the distinctiveness and the spirit of graffiti, the language of the urban jungle. The spontaneity of tagging is revealed in a cascade of colourful notes, with a particularly lively opening of Mandarin, Blackcurrant, and Rhubarb. A blooming heart of Jasmine, Lily of the Valley and Peony reveal echoes of the original Flower fragrance, and an unusual dry down of Musk, Vanilla and Tea hark back to Kenzo’s Japanese roots. The bending and swaying Flower bottle is redressed in bold red, and finished with tags of its very own. Bought the perfume for my wife. Fragrance is down to individual taste but I have to say that it does appeal and the longevity is excellent. Service was very good and it was dispatched quickly. This entry was posted on Monday, September 12th, 2011 at 3:00 pm and is filed under Fragrance, New products. You can follow any responses to this entry through the RSS 2.0 feed. You can skip to the end and leave a response. Pinging is currently not allowed.